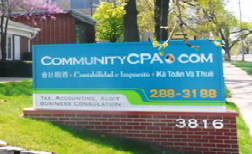 Community CPA & Associates, Inc. is not your average accounting firm. We offer expertise with empathy, knowledge with understanding, and powerful technology with a human touch. Our team is bright, hardworking, talented and professional. We truly bring a world of diversity, experience, and quality service to our clients. 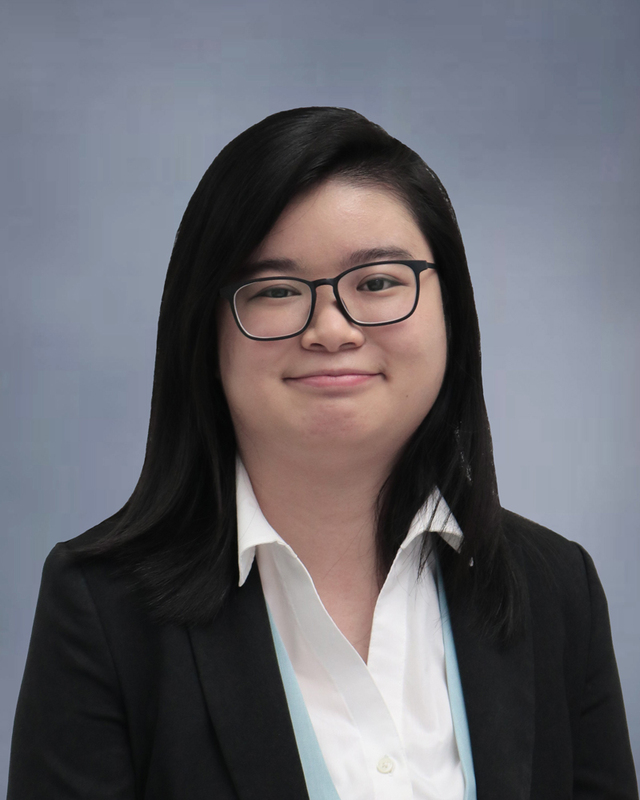 CEO and Certified Public Accountant, Ying Sa, and the rest of the team have a world of experience in domestic and international tax audit and dispute, tax planning, tax filing, accounting, payroll, and audit of non-profit and for-profit companies. No matter how simple or complex the situation you are in, Community CPA offers strategies and solutions that is easy to understand and quick to implement. At Community CPA, our team members are more than accountants to our clients. Each team member is considered a mentor, cheerleader, adviser, and partner in our client's successful business venture. Community CPA & Associates Inc. is truly a global accounting firm. Our multi-lingual staff and unparalleled technology allow the firm to effectively and efficiently serve clients in every corner of the world. The firm works with everyone from startup immigrant entrepreneurs who need help navigating the complexities of doing business in America, to large multinational American-run corporations. 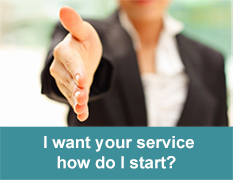 Every one of our clients is treated with the same degree of importance and respect. Community CPA & Associates, Inc. is the place where you will feel at home and appreciated. We are here to share our experience and knowledge in business and to help you succeed because your success is our success. 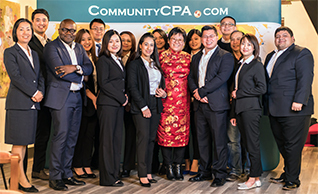 Ying Sa is the founder and Principal Certified Public Accountant at Community CPA & Associates, Inc. The firm provides tax, audit, accounting, business re-structuring and business IT solutions to businesses and individuals across the United States, Canada, and around the world. 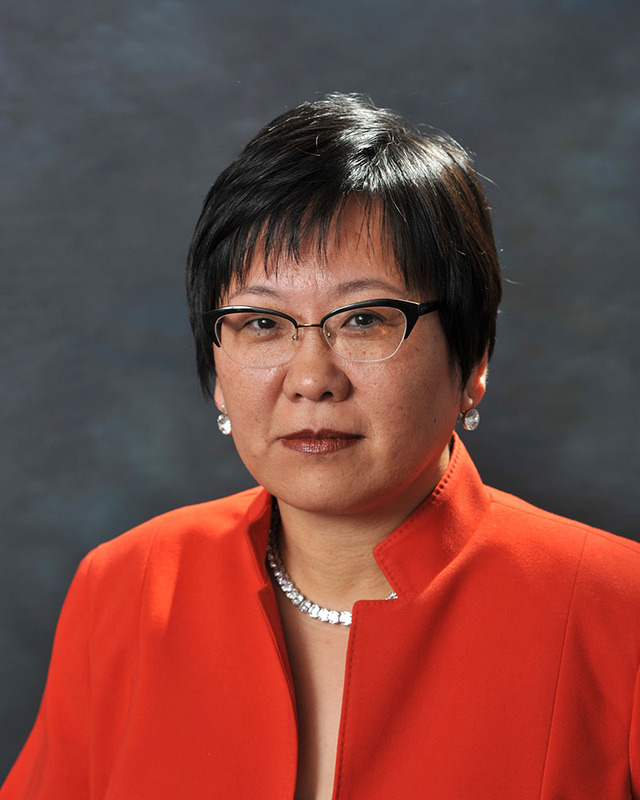 A native of China and former resident of Canada, Ying served five years as Vice President of Controllers for Wells Fargo Financial Inc. in Des Moines, Iowa, and six years as the Chief Financial Officer for the Iowa Manufacturing Extension Partnership at Iowa State University. Ying was honored with many awards for her volunteerism, entrepreneurial, and community spirit. 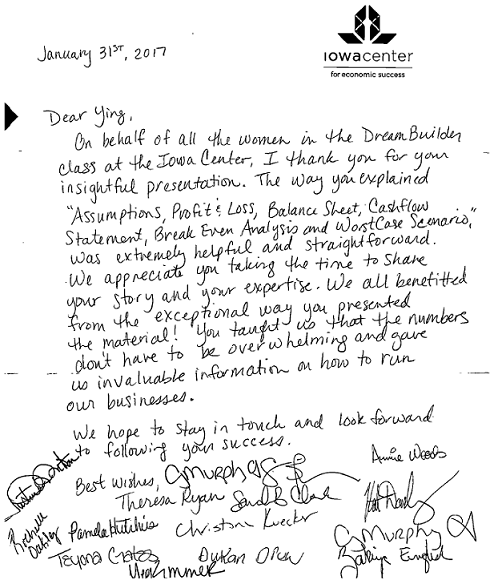 These include the Community Business of the Year Award from the Chinese Association of Iowa in 2006, the Jim Goodman Entrepreneurial Spirit Award from the East Des Moines Chamber of Commerce in 2008, and the Passport to Prosperity Award from the Iowa Council for International Understanding in 2009. On February 23, 2010, in a ceremony at the Iowa Capitol, the Governor and First Lady of Iowa presented Ying with the Iowa Volunteer Hall of Fame, the highest award given for volunteerism in the State of Iowa. Ying has successfully helped numerous large corporations, nonprofits, small businesses and individuals with a broad range of complicated tax and accounting issues. She enjoys interacting with people of all backgrounds and cultures, and she is passionate and generous about sharing her expertise with her clients. 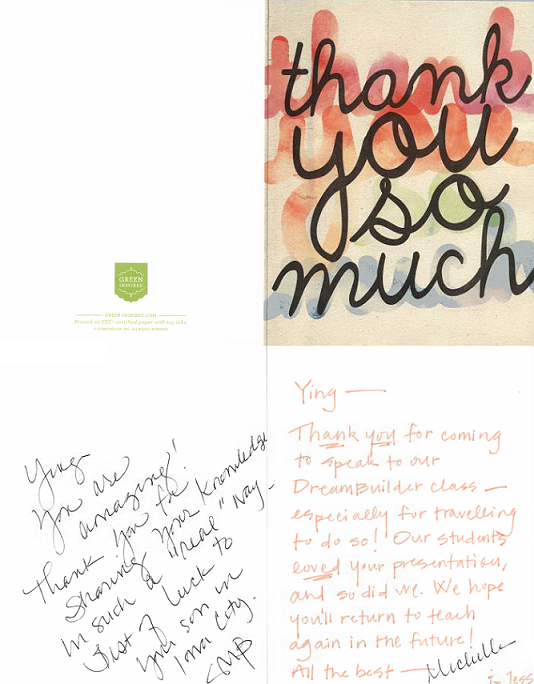 As a successful immigrant woman with broad corporate and business experience, Ying masterfully blends her unique life experiences and perspectives into her own professional work and her service to clients. In May of 2013, the Governor appointed Ying to serve on the Board of Iowa Accountancy; she served until May of 2019. Upon meeting Ying, her devotion and passion to the industry and the community become immediately apparent. Her expertise, experience, compassion, and professionalism provide an unparalleled level of service that builds long lasting trust and relationships. 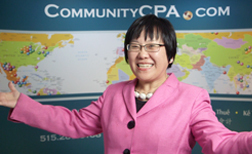 Song Jing Mo is a Partner at Community CPA. Born in Panama, he graduated with honors from Iowa State University with a double major in Finance and Management and a minor in Economics. His innate, natural born leadership qualities sets him apart from many and allows him to balance professional service and friendship with ease. His calm and collected demeanor as well as the willingness to be there in times of need for both the Firm and clients makes him the second most sought in our Firm. Bo Dong is the Tax Manager of the Firm. He is from China and is fluent in Mandarin Chinese. He received his Master of Business Administration with an emphasis in Financial Resources from Drake University in 2010. He completed his MAcc at Drake University in 2012 and passed all four CPA exams in 2017. 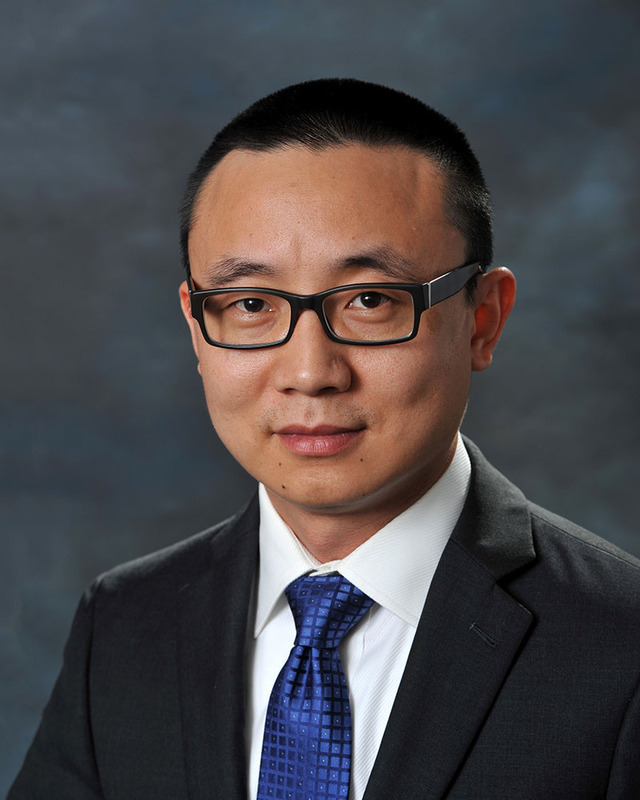 He is especially sought after by our Chinese clients who trust Bo to handle their pressing accounting and tax issues. When you first meet Bo, he might appear a bit rigid but that discipline serves the clients well. His high standards for accuracy and his care and commitment to the well-being of our clients are second to none. 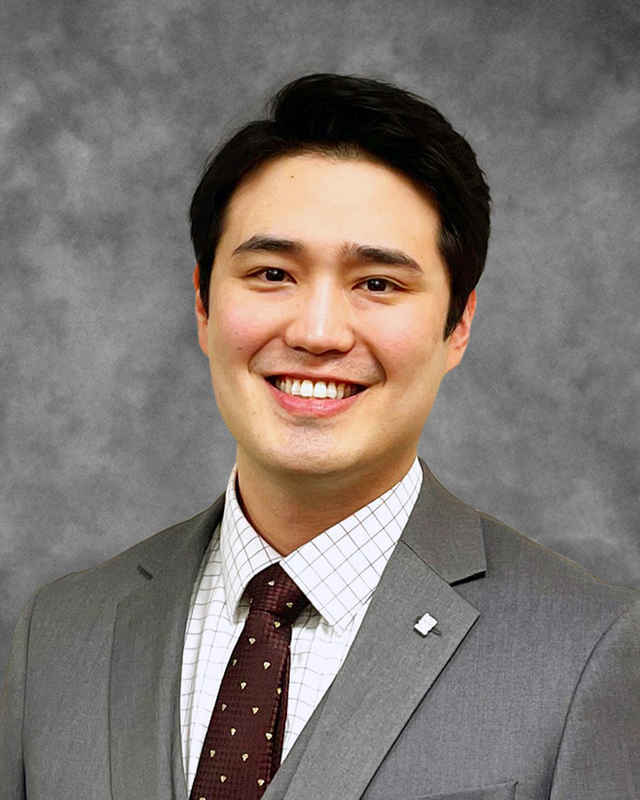 Dan Yul Kim currently serves as the Branch Manager of the Iowa City branch. Dan is also in charge of the Firm's business development and marketing efforts. 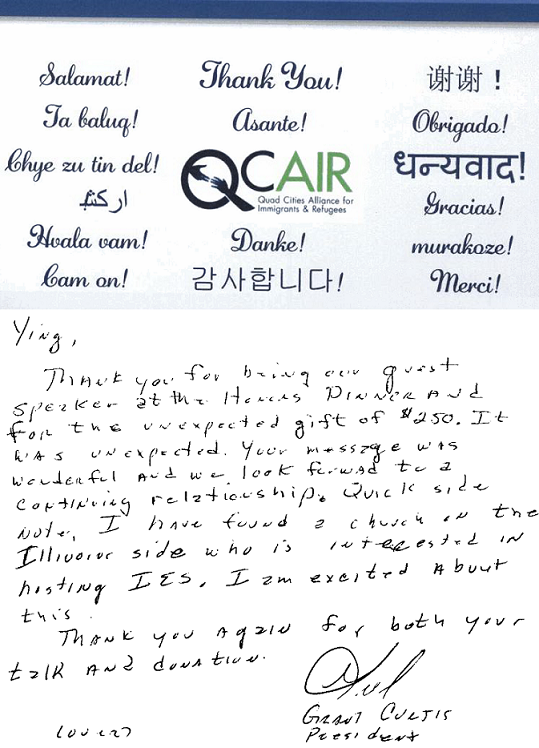 As part of the Firm's sponsorship and dedication to its community, Dan undertook the role of Program Manager in 2013 at Immigrant Entrepreneurs Summit, a 501c3 nonprofit organization, Ying founded in 2008. He is a graduate of AIB College of Business in Business Administration with background in Accounting. 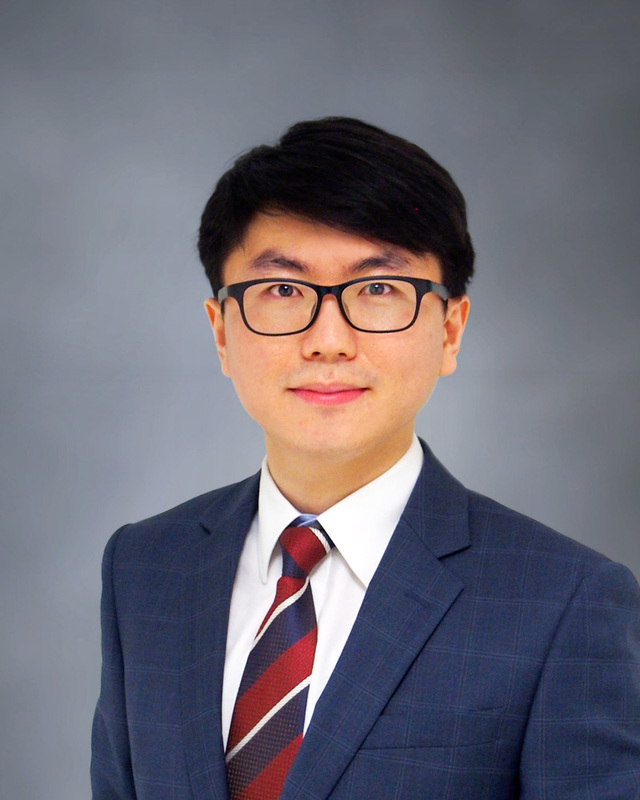 Born in Korea, Dan is a Korean native speaker and is the cheerleader at the Firm. His jovial and optimistic demeanor is contagious so he is the person you will want to talk to when you need your spirits lifted. 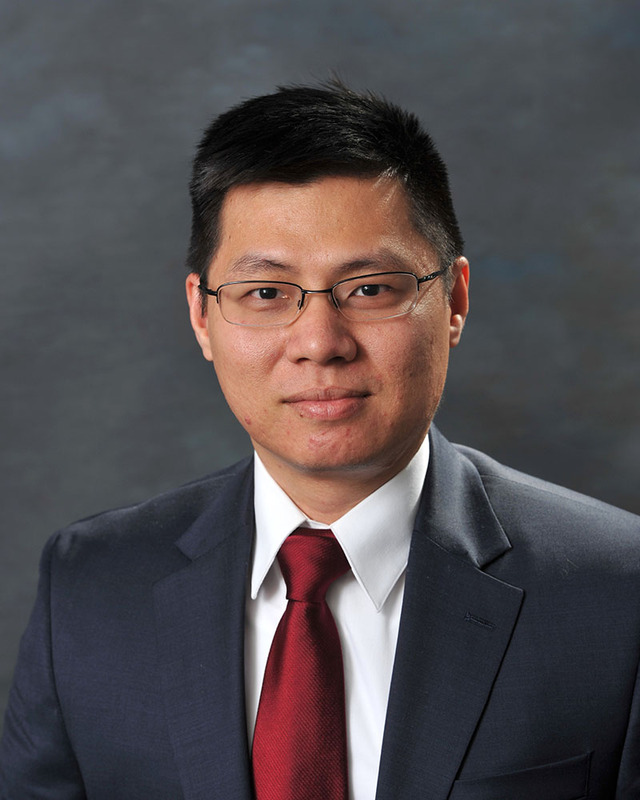 Don Nguyen is the Firm's legal counsel. Don is a member of the Iowa Bar and Supreme Court and the United States District Court for the Southern District of Iowa since 2007. Don has obtained his Juris Doctor (J.D.) degree from the Southern California Institute of Law and also holds a Bachelor of Science degree from Iowa State University. Don provides legal counsel and guidance to the Public and Private Corporations and Nonprofits and also advises finance and corporate development regarding mergers and acquisitions and other transactional matters. He is a dog lover and an avid fisherman. 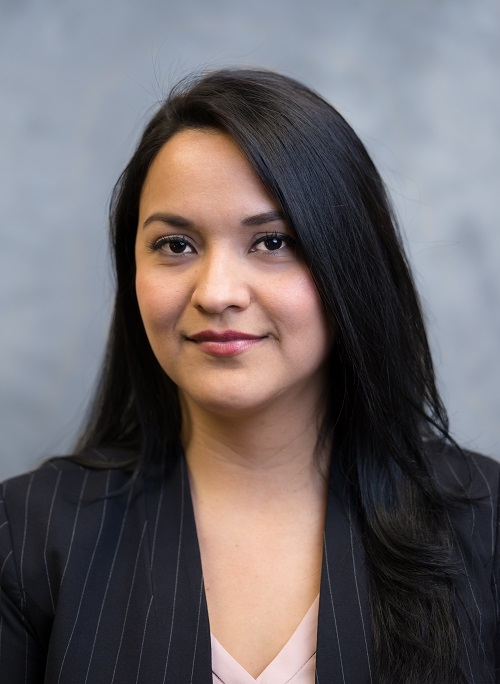 Monica Parra assists clients with any accounting and taxation needs at the Des Moines office. She especially works closely with the Spanish speaking clients. She received her degree in Accounting and Finance from Marco Fidel Suarez University (Medellin- Colombia) in 2010. She is from Colombia and is fluent in Spanish. Her smile and sweet nature is contagious and will reassure you are in good hands. Khwan Rapeeporn Chomjungwad Khwan Rapeeporn Chomjungwad has been with the firm for more than 10 years. 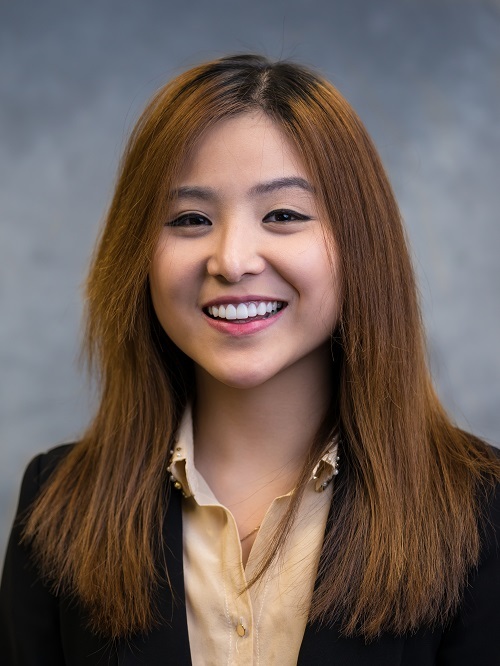 She is fluent in Thai language and received her Masters of Accounting from Drake University in 2007 and her Bachelors’ degree in Accounting and Management in 2006 from Drake University. Khwan’s elegance and calm demeanor always bring a sense of tranquility to the office even amid the most hectic storms of tax season. 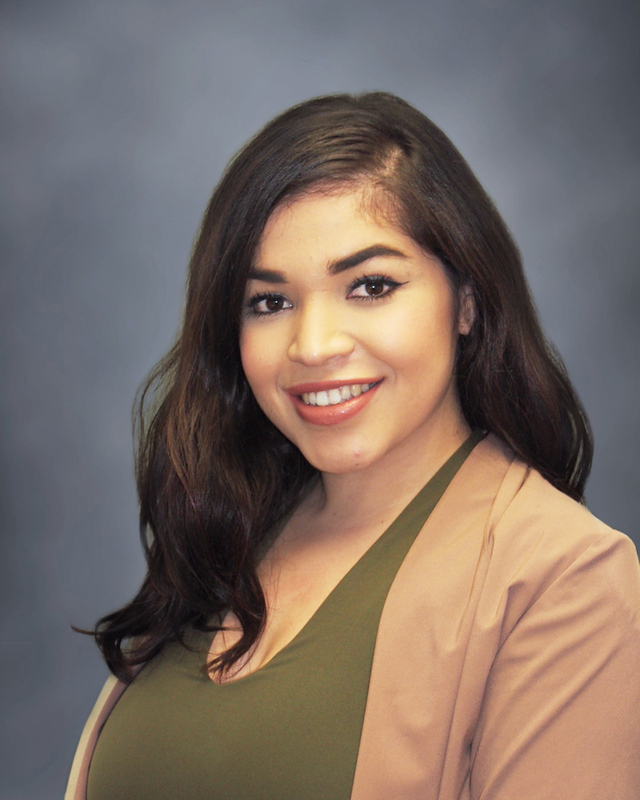 Milagro Nava is the first person to greet you when you visit the Des Moines office. She makes sure everything is running smoothly with the Firm's account receivables and ensures there are no surprise with your account payables. Milagro also works closely with our lawyer to assist clients with legal and immigration needs. She is from El Salvador and speaks Spanish beautifully. Her sweet and infectious personality makes her one of the most popular person to talk to among all the staffs. Eileen Lee assists clients with business projection, business valuation, accounting and audit needs at the Des Moines office using statistical modeling and statistical analysis techniques. She received her degree in Mathematics from the University of Iowa in 2016. She is from the Republic of Korea and is fluent in Korean (and Chinese). Eileen enjoys the outdoor activities and is the social butterfly at the Firm. She is detail oriented, very efficient with tasks at hand, and a great communicator putting any anxious client at ease. 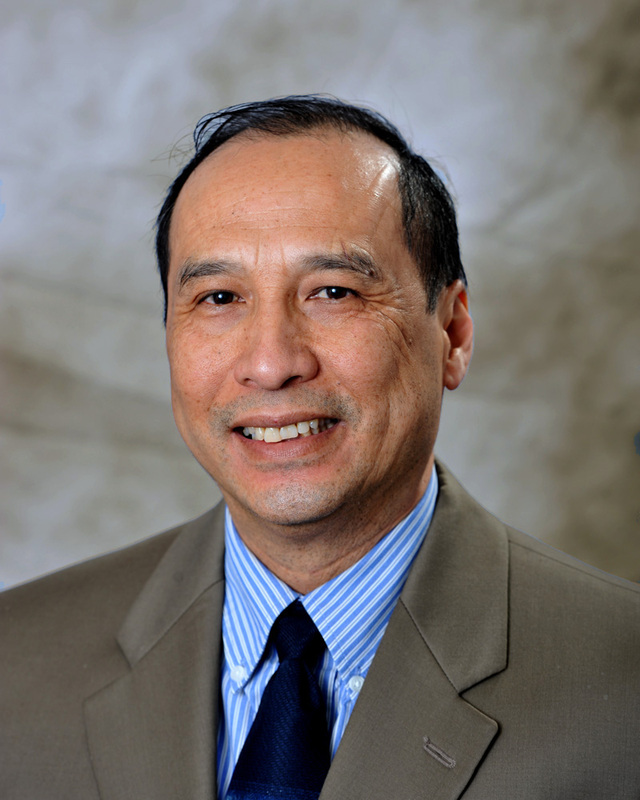 Hang Vu assists clients with any accounting and taxation needs at the Des Moines office. She graduated with honors from Simpson College with a double major in Accounting and Business Management in May 2017. 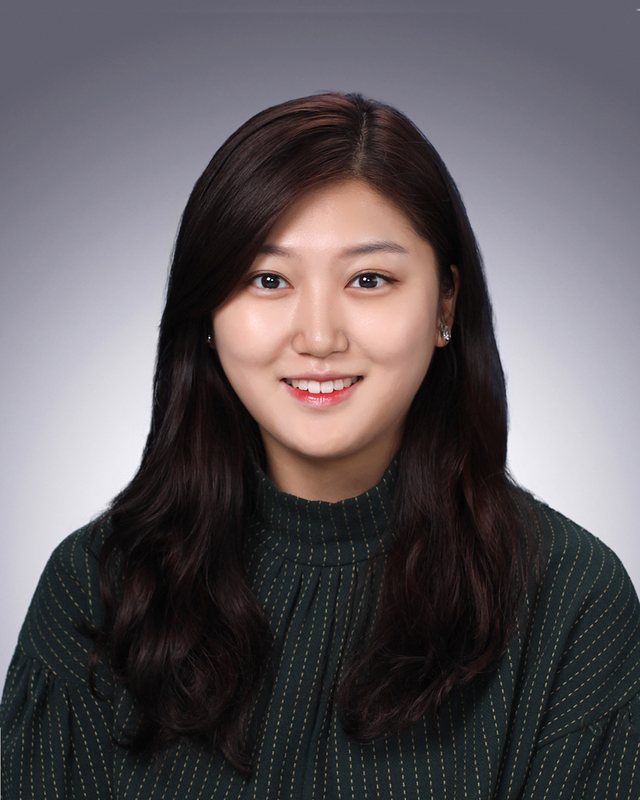 Upon her graduation, she received the Outstanding Senior in Business Management Award, which is given every year to one senior with the highest GPA in each major. Hang is from Vietnam and is fluent in Vietnamese. She enjoys listening to classical music and is known for her willingness to help whether that is a colleague or a distressed client. 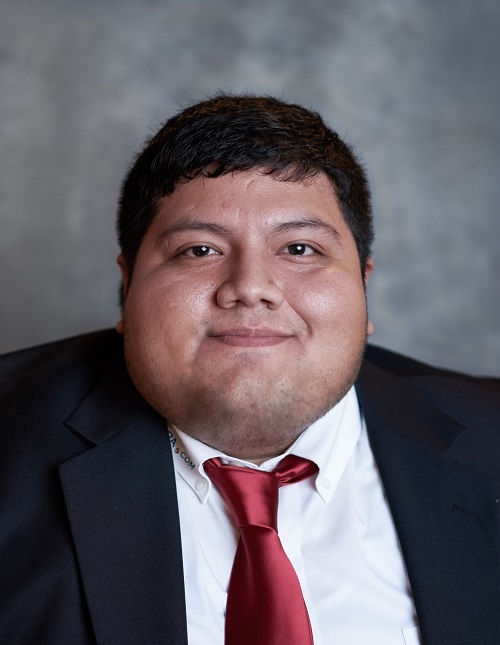 Luis Ordeñana assists clients with any accounting and taxation needs at the Iowa City office. He specializes in working with our Latino community clients. He received his degree in Business Administration and Management at Kirkwood Community College in 2008. He accumulatively worked in the field of insurance and tax for the next 8 years before joining the team. Luis is from Ecuador and is fluent in Spanish. At home, he works on cars and enjoys learning new languages with his wife, Carmen, and son, Tito. 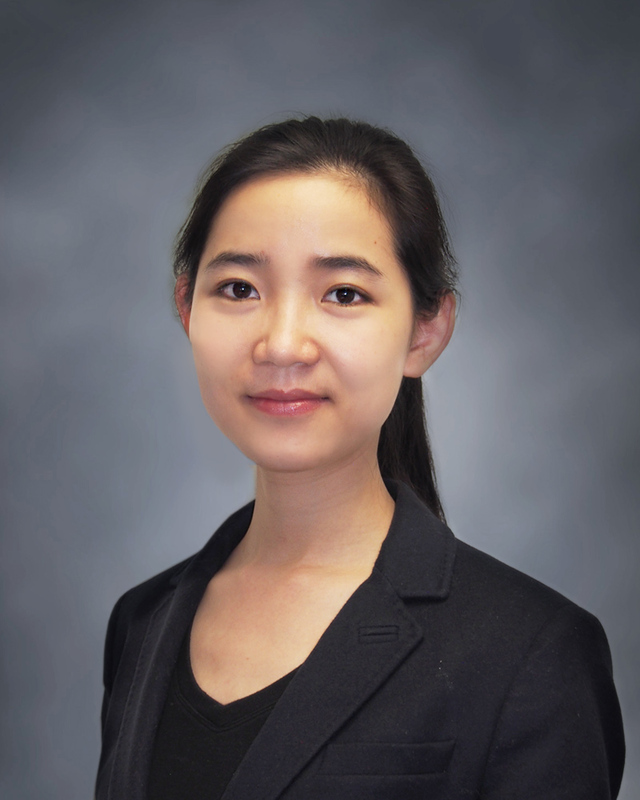 Tiffany Wang assists clients with any accounting and taxation needs at the Iowa City office. She especially works closely with Chinese speaking clients. Tiffany received her bachelor and master degree in Accounting from Truman State University in 2016 and 2017, respectively, and passed all four CPA exams in September before joining the team. She is from Shenzhen, China and is fluent in Chinese. Tiffany is a history buff and enjoys reading classic novels. She is very persistent and focused which translates to her success in working through client’s tough situations. 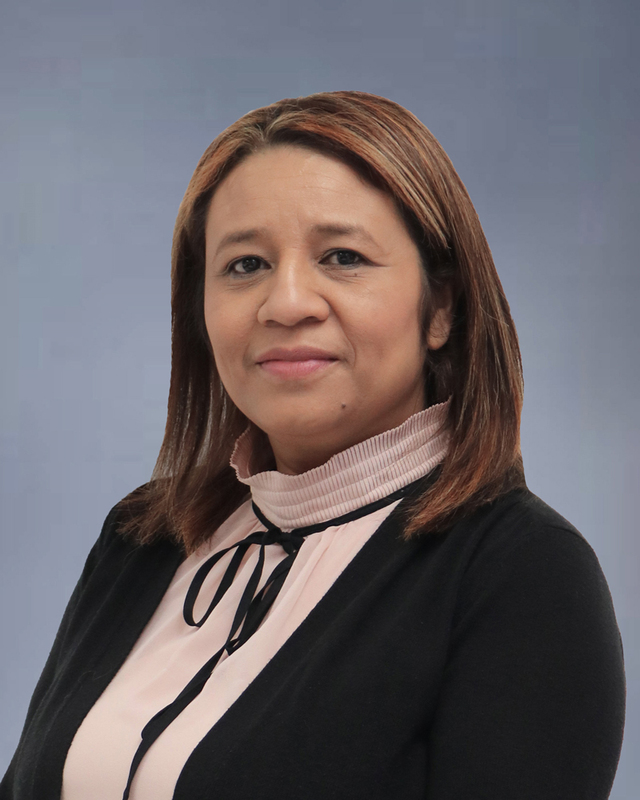 Maribel Medina is the newest addition to the team and assists clients with any accounting and taxation needs at the Des Moines office. She especially works closely with the Spanish speaking clients. Maribel received her degree in Accounting from Guadalajara University (Guadalajara, Mexico) in 2011. She is from Mexico and enjoys reading mystery novels when she is not spending time with her son, Carlos. Her calm nature, great sense of humor, and sweet demeanor makes her very popular to work with among clients. 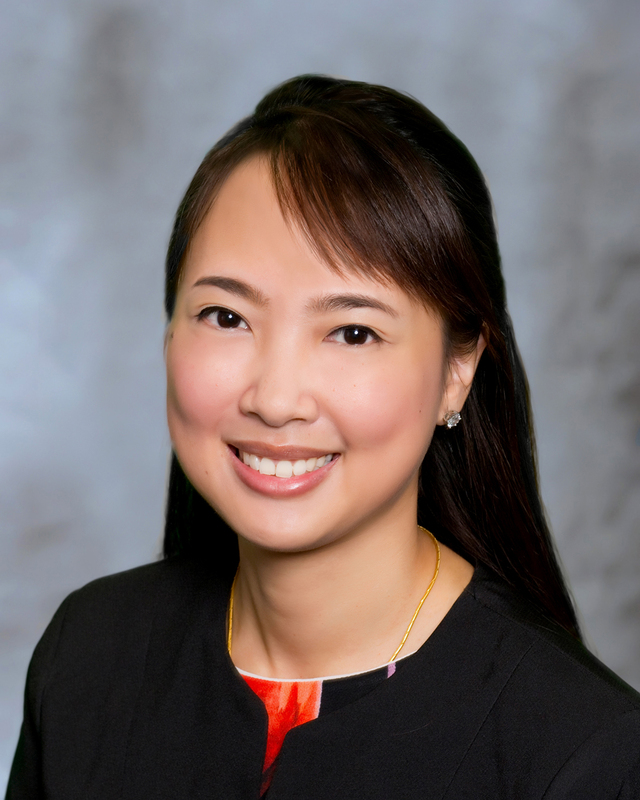 Amanda Khoo assists clients with their accounting and taxation needs. She received her degree in Finance and International Business in 2017 from Drake University. Amanda is from Penang, Malaysia and speaks Chinese, Malay/Indonesian, and Hokkien. She is very active in the community and enjoys volunteering at community events such as IES annual summits. 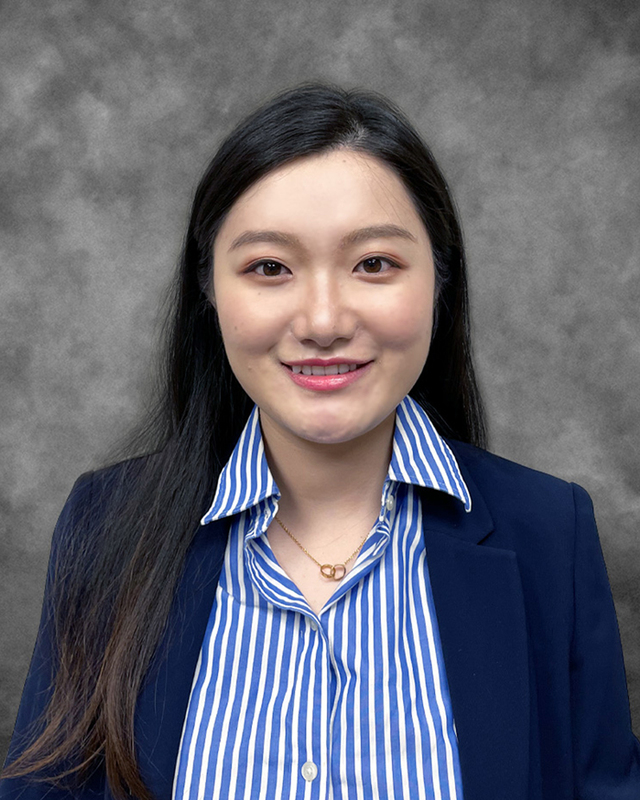 Jolene Wang is a CPA and assists clients with any accounting and taxation needs at both Des Moines and Iowa City office. She received her Master of Accountancy from Western Illinois University. Jolene has a work ethic like no other and able to undertake any tough situations with grace and professionalism. She is from China and speaks Mandarin Chinese. In her spare time, she watches literary films. 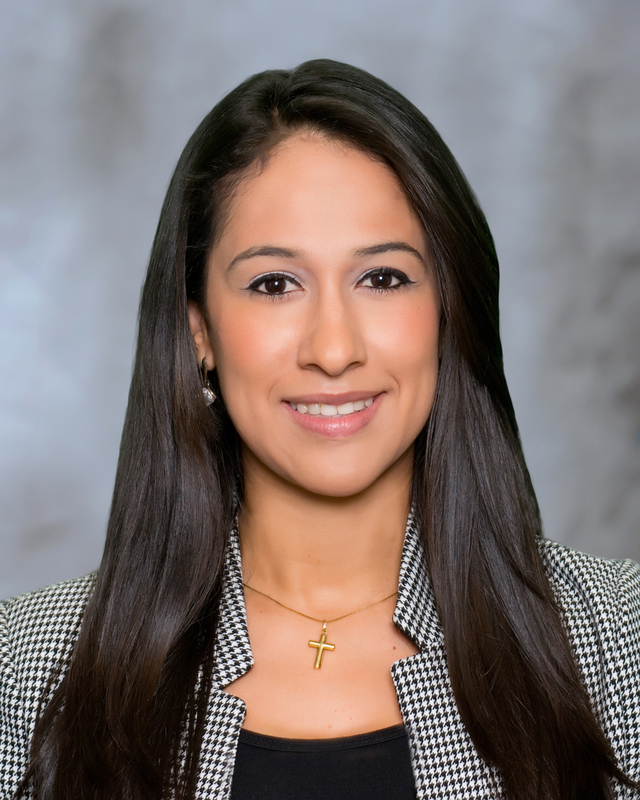 Moni Figueroa assists clients with accounting and taxation needs at the Des Moines office. She received Bachelor of Science degree in Accounting from AIB College of Business. Moni is the most outgoing and energetic person you have met and her spirit naturally brings joy to clients and to the rest of the team. She is a California native and is fluent in Spanish. If she is not in the office or out with her friends, then she will be at home drawing and painting. Jay You assists clients with any business projection, business valuation, accounting and taxation needs at the Des Moines office using statistics or data analytics as well accounting tools. He received his degree in Accounting and Business Analysis & Information System from the University of Iowa in 2018. He is from Seoul, Korea and is fluent in Korean. He is very efficient and one of few men who excels in multi-tasking. He enjoys watching NBA games in his spare time. A peer review is a periodic outside review of a firms accounting and auditing practice aimed at helping the firm maintain and improve the quality of its services. We are pleased to announce the successful completion of an independent peer review of our firms accounting and auditing practice in May of 2014. The Iowa Accountancy Examining Board, the state regulating agency for Certified Public Accountants in the state of Iowa, requires as a condition of renewal for a CPA firm license, that a firm that issues engagements subject to peer review must complete a peer review once every three years. Our participation demonstrates our desire to meet the profession's high standards of professionalism and our commitment to maintaining and improving the quality of our practice. Our peer review was conducted by qualified reviewer, James N. Kennedy, CPA, of Kennedy & Kennedy CPA, Victorville, California. The reviewers first determined that we have an adequate quality control system, and then verified that professional standards were followed in a representative sample of our accounting and auditing engagements. After thorough study of our policies and procedures, the reviewer(s) concluded our firm's system of quality control for the accounting and auditing practices in effect for the respective years has been suitably designed and complied with to provide reasonable assurance of performing and reporting with applicable professional standards in all material respects. 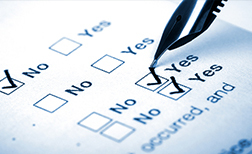 Our firm is committed to periodic peer reviews to foster quality performance. If requested, the firm will provide a copy of the report on the results of the review to all interested parties, although it is not required to do so. Bankers, bonding agents, investors, suppliers, legal advisors and others use the financial statements our firm audits, reviews, or compiles. We think those people, our clients, and our own staff deserve independent quality assurance that our firm provides quality service. 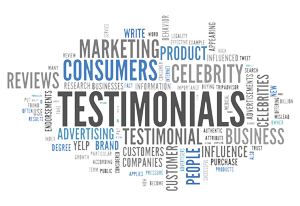 We are proud of our peer review results and would be happy to answer any questions you might have. To view our most recent peer review report, please click here. The Community CPA & Associates, Inc. Code of Conduct defines underlining values and the standards with which we conduct our business. It is designed to provide everyone, including our clients, with a clear understanding of how we should perform on a daily basis. It is a road map to guide the actions and behaviors at Community CPA & Associates, Inc. Our Code of Conduct outlines the resources available to help each of us fulfill our responsibility to both understand and comply with the professional standards. Every year, we review and affirm the agreement to comply with the Quality Control System and the Code of Conduct. All employees complete mandatory training that reinforces the principles of the Code of Conduct, and the use of the System further builds understanding of the firm’s expectations. Through these self-governed measures and the vigilance of all of our employees, we work hard to maintain a culture that values integrity in all areas of our company. Read about Community CPA & Associates Quality Control System. Your payment and personal information is always safe. Community CPA’s website uses Secure Sockets Layer (SSL) software which is the industry standard and among the best software available today for secure commerce transactions. SSL encrypts all of your personal information, including credit card number, name, and address, so that such information cannot be read over the internet. We respect and are committed to protecting your privacy. All personally identifiable information collected is strictly for payment processing and payment recording purposes only, and we will not sell your personally identifiable information to anyone. To request a refund for any reason, please contact Community CPA at 515-288-3188. Upon the resolution of the issues and agreement of a refund, the refund will be provided as a credit to the credit card used.